The Carolinas are known for some pretty severe weather. Protect Trees to preserve your overall building investment and to ensure the health of the foliage on your property. Damaged, diseased, or dead trees pose a potential issue during wind and weather; ensure your building and greenspace are secure. Learn to recognize and know the signs of a weakened tree, which may warrant removal, depending on the severity of the damage. Look carefully for peeling bark, cracks or dents in the trunk, holes, dead branches, and other peculiarities, like frost heaves and swelling at the base of your tree trunk. These characteristics will make the tree more vulnerable during severe weather. Give your tree a little support before the storm with some flexible ties, braces, or support cables. These can be used to put more weight on the stronger branches, preventing breakage that could shorten the life of your tree. Prune for your trees to prosper. It is imperative to prune and trim your tree in order to prosper – and to survive during extreme weather conditions. Remove any weak or dead twigs, branches, or boughs, and prune insect-infested or diseased foliage. Removing these branches and leaves allow for more light to shine-through the canopy of the tree, as well as allow for better air circulation in and around the tree. This sets the scene for growth and hardiness. Lightning can be a real problem in the southern United States; provide a lightning protection system to guide the currents into the ground and away from your trees and property. Talk to your landscape professional to learn more. Do your best to create healthy trees, which will hold up best under all conditions. Provide water, mulch, and high-quality fertilizer consistently and your trees will weather any Carolina storm! Take care of potential issues, like pests, fungus, and disease, before they become a problem with specialized treatments. 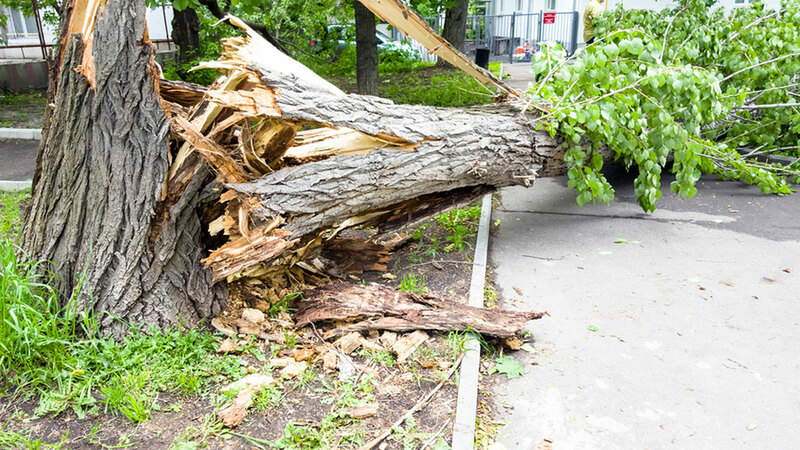 Contact an arborist or landscaping and ground services expert for assistance in treating your trees to prevent them from being susceptible during severe weather conditions. It is a fact that healthy trees will hold their own better in storms and severe weather. This further reinforces the importance of tending and maintaining the trees and foliage on your property, while also protecting your property from potential damage. Need a hand getting your trees ready for the Carolina winter? Protect trees and your investment by hiring a commercial landscaping and ground services company in Charleston, SC. Carolina Services Grounds Division is poised to help you prepare the trees and other features of your property for the winter’s worst.